The first step to reducing your electric utility bill is to understand where all the electricity is going. Actually seeing when electricity is being used and which appliances are responsible is the key to actionable cost savings. MyEyedro is a cloud service that improves on the existing real-time electricity monitoring service by Eyedro Green Solutions Inc. 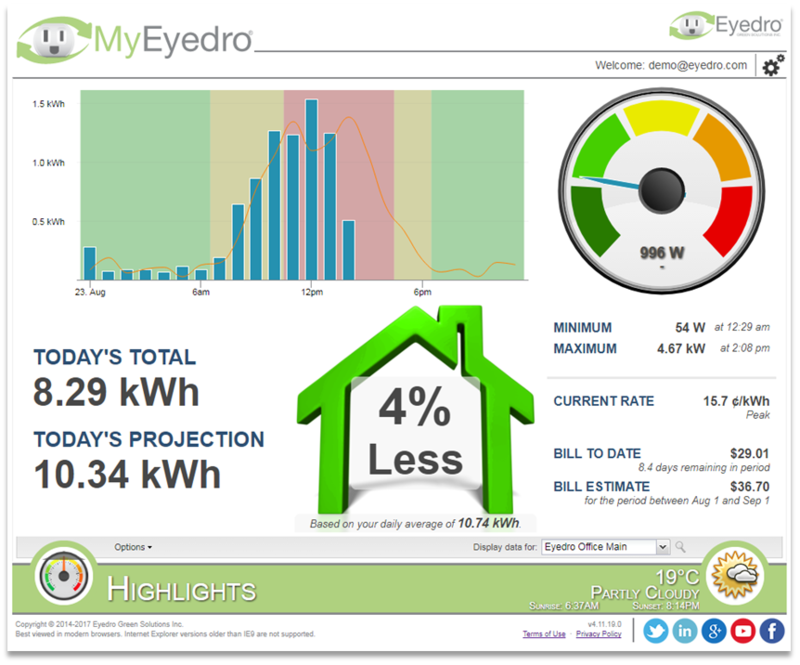 It provides users of different (home and business) electricity monitors a portal to view and track day-to-day electricity usage. Check your real-time consumption and costs, review historical data, challenge your friends, and much more. MyEyedro has been designed to be compatible with today’s most popular internet browsers: Chrome, Safari, Firefox, Internet Explorer (v.9+), and Opera. All instructions in this manual require a personal computer with internet access. Instructions will assume that your computer is turned on and you have used your web browser to go to: https://MyEyedro.com to create and/or access your account.